Salespeople: Born with It or Groomed with Time? Sales is no easy gig – especially in construction and commercial real estate. Research proves that there is a connection between personality and sales; however, how important is training in the impact potential of a sales professional? With respect to construction, I came across a survey that illustrates some numbers based on 1,000 different building companies. One striking statistic that stood out to me was that out of all participants, a total of 63% had some form of training on sales techniques. Sales talent in the construction/CRE space can be viewed through a few different lenses. 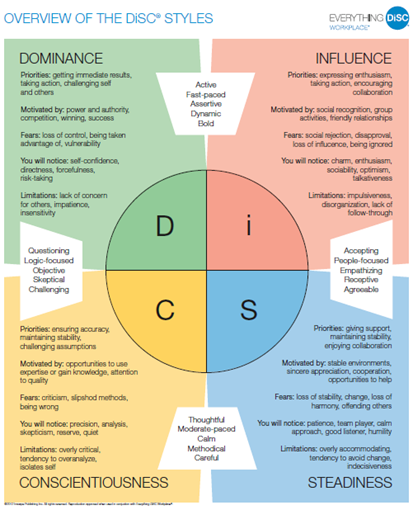 A personality matrix I look to often, the DISC Personality Assessment, assigns a profile based on a few different considerations. A synopsis is captured in the below image. From a sales perspective, once you understand your own DISC style, you can best understand how to form a sales conversation based on the receiving party’s DISC style and what they’re most receptive to. In application, it is sometimes challenging to have a people-focused sales person (I/S-type personality) present themselves to an analytical, logic-focused D/C type personality, which can be common in construction decision-makers striving to gain optimal project outcomes. A C-style customer is likely to be overwhelmed by someone using an I-style of selling. An S-style buyer might feel rushed and offended by a strong D-style of selling. Although sales training doesn’t statistically equal a clean-cut bump in revenue 100% of the time, creating a strategy that allows you to be best conveyed and received does. Sales training allows for this organization of a sales team’s presentation and objectives. The JH Greene team has found this to be very helpful from a strategic standpoint, but also as a venue to communicate with each other and troubleshoot any project challenges internally. Overall, it’s my thought that a successful sales professional offers a combination of personality traits favorable towards the role, but also a fair amount of training and preparation—in the construction and commercial real estate realm especially.